Challenger Hair Care is an up-and-coming men’s grooming and styling brand. If you’re serious about styling the best hairstyles and taking care of your hair, you’ll want to try out Challenger. With men’s hair products made from natural ingredients, their stuff is perfectly designed for men who want to use the best pomade, cream, paste, shampoo, and conditioner. While being able to get trendy haircuts has a lot to do with genetics, the way you style your hair and the quality of the styling products you apply can be a huge factor. 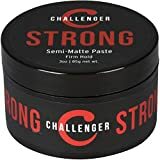 From a top-rated matte cream pomade to a strong-hold paste to a gluten-free shampoo and conditioner combo, Challenger has developed a number of popular products for guys. The company even went as far as developing a non-comedogenic pomade to help men get rid of pomade acne. In this Challenger Hair Care review, we will explore the pros and cons of the brand’s hair products. Whether you have thick, thin, wavy, or curly hair, you’re going to want to use something that is a cut above the rest, and after testing, we think Challenger has something for everyone. Here are the top hair products for men from Challenger! 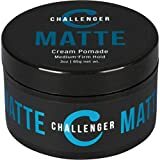 Challenger’s Matte Cream Pomade offers a medium to high hold, shine-free finish that is perfect for thick, textured hairstyles and hard-to-tame hair types. This cream pomade is an excellent shaping cream for all hair lengths and styles, including short, medium, and longer hair, and it does all of this without clumping or flaking throughout the day. The scent is light, clean, and refreshing, but it is almost undetectable once you have finished your styling your look. Unlike many thick pomades that are difficult to wash out, this Matte Cream Pomade is easy to rinse at the end of the day thanks to its water-based formula. In fact, those who use it regularly say they don’t even need shampoo to completely remove the product from their hair. It’s also perfect for travel thanks to its 3-ounce jar. The ingredients are designed to offer up just the right amount of hold along with excellent conditioning. For instance, the use of candelilla and carnauba wax as well as agave leaf extract help with hydration, acting like a natural conditioner. Similarly, the inclusion of all-natural ingredients like kelp and slipper elm bark extract can help promote healthy hair growth. The company’s Matte Cream Pomade product is cruelty-free and never tested on animals, which makes it an ideal choice for vegans. It’s also made in the USA. Whether you’re styling a comb over, textured brush back, quiff, or faux hawk, this matte hair product will deliver the control you need with a natural finish. As one of the top-rated cream pomades on the market, we definitely recommend you try it. 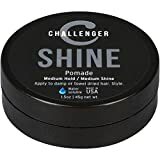 If you’re looking for a medium-hold, medium-shine styling product, then Challenger’s Shine Pomade is an excellent choice. In addition to not making your hair appear greasy or feel crunchy, this pomade can give you a clean, wet finish that will last all day. The beauty of this pomade product is that it can tame thick or curly hair without looking stiff. We’d recommend using the Shine Pomade product on short to medium-length hairstyles that require some movement and flow. This includes styling a slick back, pompadour, quiff, and comb over. If you have particularly coarse hair or intense curls, consider a strong pomade. Moreover, this pomade smells really good and clean, but the scent is light, subtle and won’t linger for more than a second. And because it’s water-soluble and easy to rinse out in the shower, this product won’t dry out your scalp or strip your hair of its natural oils. It also helps that the list of ingredients includes glycerin and beeswax, both of which provide hydration and conditioning for soft, smooth hair. Our only qualm is the use of fragrance in the formula. However, thanks to the great blend of other ingredients, it spreads through your fingers beautifully, making it easy to apply and use. If you like styling the hottest hairstyles of the year or you need to smooth out stray hairs when parting your hair to one side, Challenger Shine Pomade is worth the investment. If you don’t believe us, just check out the testimonials of other guys using the product! Sometimes, light and medium hold products just aren’t enough to help you achieve the most popular hairstyles, and that’s exactly where Challenger’s Strong Paste comes into play. This styling hair paste is best for very short to short haircuts that require a strong hold. With moderate shine, it locks your hair in place all day long for maximum control. Because of products thick, sticky nature, we highly recommend you apply it to slightly damp hair. However, adding just a bit of water “reactivates” the product, allowing you to rework your style as needed. Plus, beeswax is on the list of ingredients, so your hair will stay hydrated and not dry out. This quality paste also sports Challenger’s signature good scent – a light but clean fragrance that won’t overpower your favorite cologne or body spray. Although the product is powerful, it’s still a water-based formula, meaning you won’t fight to rinse it out. Ultimately, this Strong Paste is ideal for cool short hairstyles like the crew cut, French crop, spiky hair, and side part. It doesn’t flake or clump up, and it won’t change color and leave a gray residue like some other high-hold products out there. For men with sensitive skin or guys who are prone to pomade acne and breakouts around their hairline, not just any product will work. You will need something that is non-comedogenic and specially designed to keep your pores clean and clear. 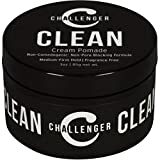 Challenger’s Clean Cream Pomade was formulated for sensitive skin, and is perfect for teens, athletes, and anyone else concerned about their hair products causing acne. This non-comedogenic pomade offers a medium to firm hold with a natural, matte finish, which is ideal for today’s trendy textured haircuts for men. Despite being rich and creamy, this water-soluble product will never clump up or leave a dull residue behind. And unlike most gels, it won’t flake or leave your hair feeling stiff or crunchy. The end result is a cream pomade that works well with any number of stylish cuts and styles that require a strong hold and natural finish. If you have short hair that needs a little taming, or even if you have medium-length wavy or curly hair, this product will keep it in place all day. The best part is you’ll never have to worry about acne on your scalp and around your hairline. After using this creamy pomade, you’ll be able to get rid of the acne caused by other bad hair products. Finding a good shampoo and conditioner combo for men can feel like a hassle that’s not worth the time and research. Fortunately, Challenger’s Daily Men’s Shampoo and Conditioner delivers the intense cleansing, moisturizing, and conditioning necessary to keep your hair and scalp healthy. While most guys don’t need to shampoo every day, those who do need products that won’t strip their hair of natural oils or clog their follicles. Instead of sulfates or artificial dyes, this shampoo and conditioner is infused with all-natural ingredients. The shampoo formula includes quality elements like argan oil, biotin, keratin, Vitamin C and D, tea tree oil, peppermint oil, and eucalyptus. Similarly, the conditioner comes with jojoba oil, shea butter, aloe, coconut oil, hydrolyzed keratin, and Vitamin B5. Tea tree oil acts a natural antifungal and antibacterial that will minimize acne and dandruff, while actively minimizing allergic skin reactions. Combined with shea butter, argan oil, jojoba oil, and the other essential oils on the ingredients list, using this shampoo and conditioner combo regularly ensures thick hair growth, good scalp health, and excellent hydration. Particularly popular as gluten-free shampoo and conditioner, you’ll appreciate these hair products for their nourishing and moisturizing ingredients. Additionally, both smell great – the shampoo rocks a scent that blends the tea tree and peppermint for a light, fresh aroma while the conditioner is all peppermint and vanilla. In order to create your preferred style, it’s important to start with clean, healthy hair. 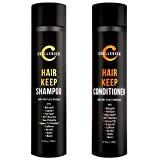 This shampoo and conditioner combo from Challenger will help you grow thick hair and style all the best classic and modern hairstyles. Hair loss is a common concern among men of all ages but navigating the hundreds of products that claim to stop thinning or balding and regrow hair can be annoying. With so many fake product reviews or shady marketing gimmicks, finding a good hair loss solution can feel impossible. Challenger Hair Loss Shampoo and Conditioner, also known as their “Hair Keep” line, offers a DHT-blocking formula that protects and stimulates your hair follicles to nurse them back to proper health. The shampoos drug-free formula boasts an all-star lineup of natural ingredients like Capixyl, Baicapil, HairSpa, saw palmetto, caffeine, biotin, and keratin. Similarly, the anti-hair loss conditioner has active ingredients like Baicapil, Rejuvasoft, coconut oil, arganoil, caffeine, keratin and biotin. Combined, these ingredients prevent further hair loss and even stimulate regrowth. While the essential oils are great at hydrating and moisturizing your scalp to prevent dandruff and promote healthy hair follicles, the real strength of this solution comes from the rest of the ingredients. Capixyl, Baicapil, HairSpa, and Rejuvasoft are patented products that have been proven to reduce loss, encourage growth, and increase hair density. Similarly, the inclusion of saw palmetto, a proven DHT blocker, is a very promising sign. Blended with caffeine and biotin, this powerful shampoo and conditioner will help you combat hair loss and improve your chances of regrowing thicker, fuller hair. Furthermore, the shampoo and conditioner also work to keep your existing hair healthy by fortifying the hair shaft and preventing breakage. In fact, users claim that using both products together gets results in about 2 months. It’s also nice that the light but invigorating scent is pleasant and fresh. Made in the USA, you can buy Challenger’s hair loss shampoo and conditioner with confidence. It has as many of the best hair growth stimulating ingredients as the top-rated products that cost far more. 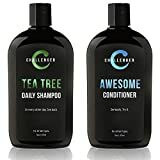 New Hair Keep Combo - Hair Growth Shampoo & Conditioner - Challenger DHT Blocking Premium Combo - w/Baicapil, Capixil, Rejuvasoft, HairSpa, Caffeine, Biotin, Argan Oil, Coconut Oil & more! Today’s trend of single products designed to cleanse your entire body may be convenient, but they aren’t doing your hair or skin any favors. 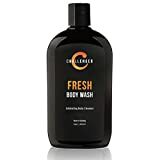 Challenger’s Fresh Body Wash is a standalone product that helps remove dirt, excess oil, and even dead skin cells while leaving your skin nourished, soft, and smelling fresh. It contains gentle exfoliating beads, which means you don’t have to invest in a loofah to get your scrub on. As an excellent exfoliating body wash, the small beads create just the right amount of friction to really clean your skin, leaving it soft and smooth. While it was made with with men in mind, it’s also suitable for women – the non-irritating formula is safe enough for use on even your most sensitive areas. Ingredients like aloe, jojoba oil, and silk amino acids leave your skin feeling fresh and baby soft; others, including vitamin E and tea tree oil, nourish and gently cleanse. Altogether, you get a cleansing, moisturizing, and conditioning wash good enough to use as a face scrub. Its fresh scent is gender-neutral with a hint of citrus, but it is light and invigorating. Made in the USA as a sulfate and gluten free body wash product, you can’t go wrong trying it out. For soft, smooth, and healthy skin, we highly recommend a bottle.